Ed. Note: I am a native New Yorker and a huge pizza lover. I have never heard of Chicken Bacon Ranch pizza. Admittedly I haven’t lived in New York in over 18 years. 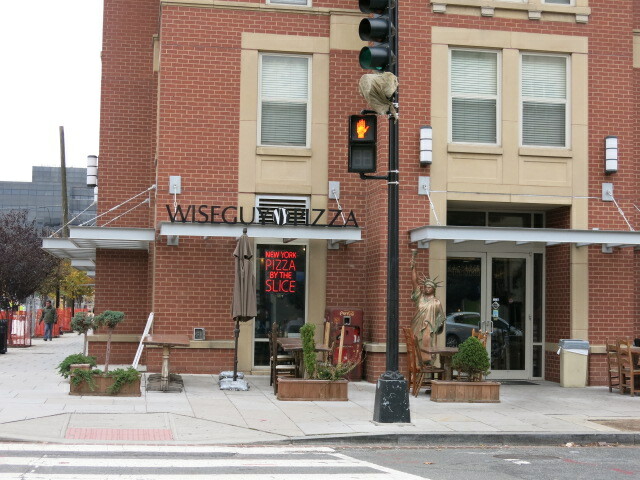 Though I too consider Wiseguy New York Pizza the best pizza in DC. In fact, Wiseguy NY Pizza could smack me in the face and make me eat mayonaise and I’d still return for their pizza. I moved here last year with fairly low expectations for DC pizza. No big deal — I can eat it when I’m home. However, I found a place that totally surprised and impressed me: Wiseguy New York Pizza in Chinatown. Hands down, Wiseguy is the best DC pizza I’ve had in my two years here, and is nearly as good as real New York pizza. I stumbled into it accidentally and was shocked at how good their pizza was, but not just any pizza — Chicken Bacon Ranch pizza, which every New Yorker knows is the BEST kind. There was a point last year when I regularly walked out of my way just to get it. It’s great. Recently, after quite some time of not having Wiseguy, I went back and brought a group of friends, telling them how great the Chicken Bacon Ranch pizza is. I got there, they didn’t have it on the shelf, I asked for it, they said they didn’t have it, I got something else (begrudgingly) and I moved on. Last night, I called ahead of time. I said I was coming in in about an hour and would like to get a couple of slices of chicken bacon ranch. I hung up the phone and grabbed my friend and took him to Wiseguy. They had Chicken Ranch pizza on the shelf — but with NO BACON. I asked for two slices of that but with bacon on it and he said no because they “don’t alter their pizzas.” So I told him I had called ahead to request it, and he says, “Oh, are you (my first name)?” And he takes out a whole Chicken Bacon Ranch pizza from the oven and says, “you ordered this.” And I told him that I didn’t want an entire pizza, I just wanted two slices. I asked him if I could just have two slices of that, and he said no, I can only buy the whole thing. So, I asked what he was going to do with it if I didn’t buy it, and he said he was going to let it go to waste. So I asked him again for two slices of Chicken Bacon Ranch, and he again said I could only buy two slices of Chicken Ranch (no bacon). And I told him that’s not how it works in New York, which he obviously replied “this isn’t New York,” and then I pointed out that they call themselves Wiseguy NEW YORK Pizza, which he didn’t have much to say to. I think I won that round. I left without buying the Chicken Ranch. I even contacted the manager and he stood by the policy that they don’t alter the pizza and said they no longer put bacon on their chicken/ranch pizza — which is insulting to CBR lovers everywhere. Anyway, I’m upset. And now I need a new pizza place because they clearly aren’t as great as I thought they were. Such terrible service. I even offered to pay extra for the bacon but to no avail!